Up until April, Nicaragua was the most peaceful country in Central America. July 19 (teleSUR) “We were in the opposition for 17 years and we never even thought about burning the houses of the liberals,” Daniel Ortega, Constitutional President of Nicaragua, said in a speech during the Masaya “Repliegue” (the retreat to Masaya city). In the book “From Dictatorship to Democracy,” Central Intelligence Agency (CIA) official Gene Sharp set up a manual that in its fifth phase indicates the breaking of institutionality and the development of a beachhead from where a country could be infiltrated with “multinational” forces to support an insurrection against the dictatorship. In fact, the creation of this phase in Nicaragua has been preceded by “tranques” (barricades or blockades of roads) where quotas are charged, and Sandinistas, police officers and ministries staff are kidnapped. Many of those kidnapped are tortured and assassinated by these “self-convened pacific opposition” groups. The attacks against public bodies and assaults on police units are led by criminals, by former Sandinistas and former “contras” (counterrevolutionary forces). Many of the conservative press and media outlets won’t stop presenting the Nicaraguan situation as the struggle against a dictatorship, despite the fact that Daniel Ortega has constitutionally won the elections, after having spent 17 years in the opposition’s side. From outlets like Deutsche Welle, going through the BBC and CNN, we get the versions that make us see a peaceful people, waving national flags, supported by an impartial Catholic Church that seeks dialogue, fighting against a dangerous and violent left-wing dictatorship. The number of killed police officers and civilians has been increasing, and if there are police officers killed by firearms it means that on the other side there are armed civilians. The crisis seemed unstoppable, but Sharp’s fifth phase never arrived. Up until April, Nicaragua was the most peaceful country in Central America. The country had an 8 homicides per 100,000 inhabitants rate, while Honduras, Guatemala or El Salvador’s rate goes as far as outnumbering 50 homicides per 100,000 inhabitants. As I have written in previous articles, this police force is exemplary and there is a lot to learn about community work and about participation in citizen security from it. At the same time, it is a police force that defends the institutionality and the Constitution. The dark destabilization plan now in place, pretends that the police force doesn’t respond to armed aggression. Since April, Nicaragua has been included in the plan for the destruction of the new democratic governments in Latin America. A plan that is conceived and orchestrated by the Think Tanks serving the large transnational corporations. I am making reference to the National Endowment for Democracy (NED) that was founded during the Reagan administration, the Usaid, the CIA, of course, and many other intelligence agencies, that work at the development of a conservative way of thinking. The ominous role of the OAS (Organization of American States) and the IACHR (Inter-American Commission on Human Rights), convicted and confessed accomplices of this master plan at the ‘American’ level, has to also be taken into account. The national oligarchies, and in this case the Catholic Church, represented by its most conservative sectors, play the local triggering role. The errors committed by the FSLN, such as the Social Security issue and other decisions that did not favor the democratic construction project that the Sandinista government is proclaiming, must also be added to the equation. This last factor must be amended as required by the strategic perspective: the destruction of these governments’ frameworks, the case of Nicaragua, which has reached armed violence extremes. This violence is driven by social actors unable to develop democratic options in which they have been defeated in recent years as is the case of former Sandinistas grouped in the MRS (Sandinista Renovation Movement). The serenity demonstrated by Ortega and his government has consolidated a massive response summoned by the FSLN that is channeling the return of the stability. The government has always attended the dialogue table, even when it meant listening to absurd proposals such as early elections that had to take place or even worse, Ortega’s resignation. The march of “El Repliegue” to Masaya, the demonstrations in Managua and those in other cities, are the way to prove the Government and FSLN party’s capacity to summon people. Certainly, this situation has polarized the country, and the proposals to restore the lost peace will have to be handled with great care. Those who thought that there would be a triumphant counterrevolutionary government board, are only left with a dangerous frustration. From the part of this right-wing, there is no real desire to return to the institutional channels, although the defeat might make them think. The personal ambitions and resentments of former Sandinistas are not the best factor for Peace. The government must deepen measures to consolidate an organized popular democracy, both in the exercise of citizen participation and in the construction of an effective popular power, as well as in speeding up the redistribution of resources and the improvement of living conditions for the still disadvantaged sectors. Moving forward in these two areas, simultaneously, is the only way to guarantee the continuity of the institutions and the governability in the country. The teachings of South America have shown us the fragility of our triumphs. These are more vulnerable when the popular power is not consolidated and when the alliances with the productive capitalist sectors are not properly managed, which must be only alliances without making those sectors part of the government. Brazil and Ecuador are the most recent examples of the right-wing’s ability to dismantle and appropriate everything that we have advanced, either by destroying it or by converting it into resources for their own benefit. 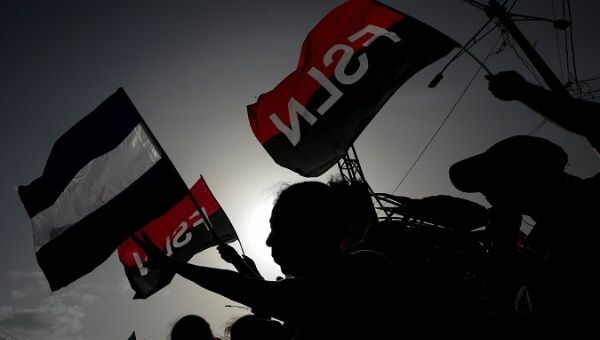 The high cost in lives in Nicaragua and Venezuela, during the attempt “to return to the dark neoliberal night,” should lead us to a deep self-critical reflection about the role of political parties, about the transformations towards a culture of solidarity and about the need to consolidate the effective and participatory mechanisms of popular power. In the political projects that intrinsically carry the proposal of an alliance of different class sectors, we must learn to handle its inherent contradictions implied. It is an extremely complex task and in that difficulty, the “Cantos de Sirena” (mermaid’s call or siren songs, a seductive or deceptive call) of corruption, enrichment and using the state as booty, are always present. Today in Nicaragua, and particularly in Managua, the month of July is Sandinista. It is “rojinegro” (red and black, an allusion to the FSLN flag). People from the “caviar left-wing” and those from the right-wing thought they would be able to celebrate the defeat of the FSLN Government but they were defeated in every single battlefield. In the political one, in the streets and in the military field where they entered by killing people. The army did not go out to the streets and it is only with the National Police and organized Sandinistas that this triumph was achieved. We can not claim victory or let our guard down, yet. We need to consolidate and deepen the popular democratic exercise, street by street, block by block, neighborhood by neighborhood, community by community. Serenity and self-criticism, as demonstrated by the Sandinista government and by the Comandante Ortega, are needed. erenity and self-criticism, as demonstrated by the Sandinista government and by the Comandante Ortega, are needed.